It is well documented that elite athletes will likely experience numerous series of physiological stressors; fatigue and cellular disturbance that have the potential to reduce performance follow a training or competition. The physiological stress depending upon the specific exercise type, duration and intensity and also on the athletes’ familiarisation to the exercise insult. This physiological stressor provides rationale to attempt to enhance rate of recovery in the elite athlete, especially when repeated performance is required in tournament scenarios or multi-day competition. Cold water immersions (CWI) are a frequently used and popular recovery modality. The mechanisms of CWI are speculated to be related to temperature and pressure induced changes in blood flow and reduced muscle temperature per subsequently reducing post-exercise inflammation. A systematic review of the research findings will provide clarity on the efficacy of water immersions as suitable recovery strategies following strenuous physical activity. Therefore, the aim of this investigation was to systematically review and discuss the literature regarding the efficacy of CWI following the two categories of physiological stress precipitated from eccentric and high-intensity exercise insults. ‘high-intensity exercise’(with a high metabolic cost eg, repeat sprint sports). Four variable Outcome was measured. (5) participants could be male or female and of any athletic training status. (3) there were insufficient data to report an effect size. Muscle power (defined as an exercise test that measures explosive muscular power (eg, a vertical jump or a 5 m sprint)). 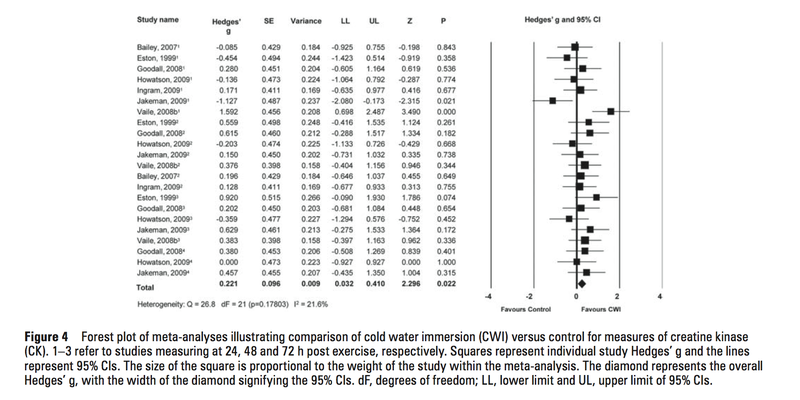 CWI was effective in improving recovery of muscle power at all time points (24h, 48h and 72h post-exercise, however the heterogeneity in the study was divergent). Muscle strength. 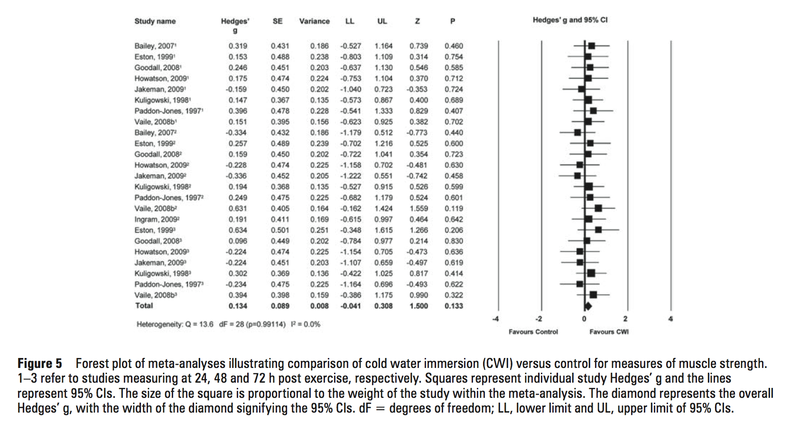 CWI had no effect on recovery of muscle strength but was effective in improving recovery of muscle power. 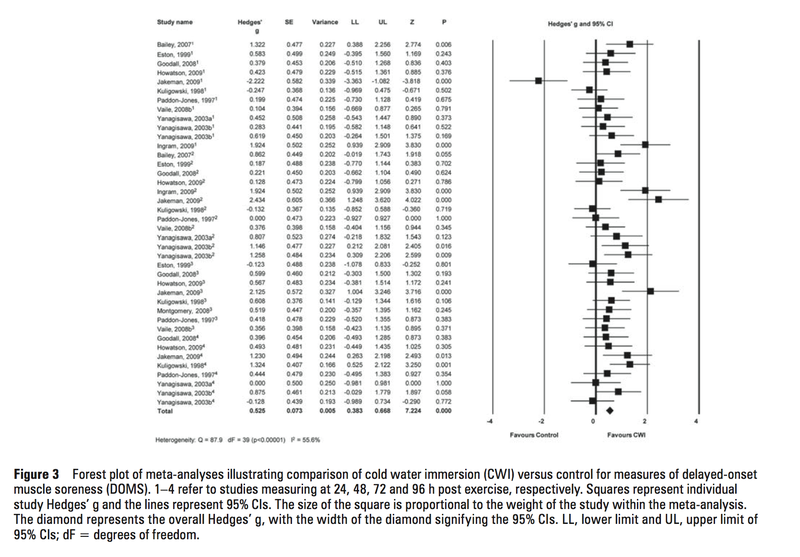 CWI was not effective in improving rate of recovery of muscle strength post exercise from 29 samples. Muscle soreness (DOMS)(perception of muscle soreness, using visual analogue scales). CWI alleviated symptoms of DOMS at 24h, 48h, 72h and 96h post exercise and was effective at 24h and 48h following high intensity exercise. Given the perceptual nature of DOMS assessments, it is plausible that the placebo effect phenomenon may have an impact on the efficacy of CWI as recovery strategy. Figure of risk of bias indicates this by in the blinding category. Creatine Kinase (CK). CWI was effective in reducing CK in the blood post exercise from 22 samples and CWI had a small but significant effect in reducing efflux of CK post exercise. CWI is frequently used as a recovery modality from strenuous exercise, despite a lack of evidence-based guidelines. This review illustrates that CWI is an effective strategy to reduce DOMS following a range of exercise types. 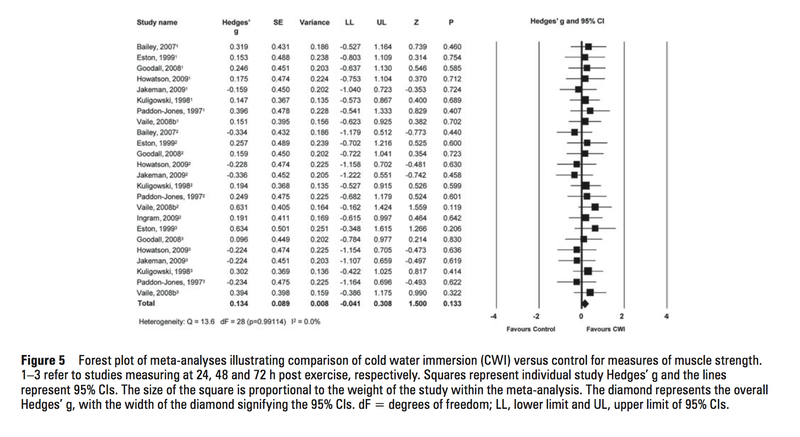 While the effects of CWI on recovery of muscle function were less clear. 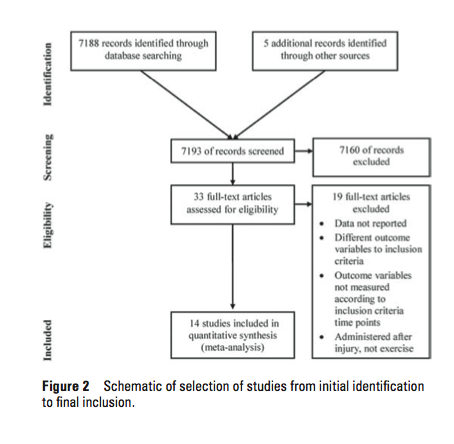 This review highlights to the applied practitioner that it may be important to understand the physiological stress induced following different exercise types before prescribing recovery modalities. While it is apparent that CWI has no acute negative effects on recovery from strenuous exercise, research should investigate chronic application on adaptation to training.